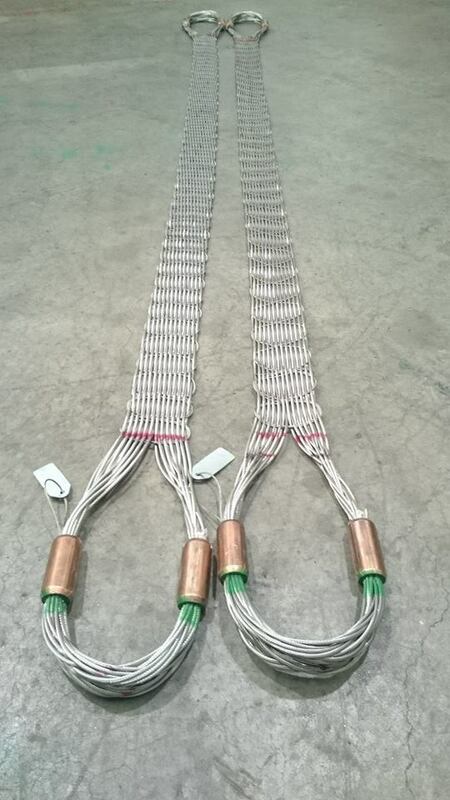 Superflex flat woven steel slings are based on flat woven steel cable. The heavy duty slings are used for general lifting purposes requiring reduced contact pressure. TYPE 1-A, machine made woven flat cable. U Termination both ends. This provides the slimmest woven steel sling. Slides easily under loads. Made from machine woven flat cable. For general lifting of bundles of tubes, bars, timber, roofing steel in cradle lift. The nominal size of these slings is just that, a nominal size. It is calculated from 24 plies laid parallel as a warp. That is the nominal size 24 x X (being the generic cord size in millimetres). Variations inevitably occur in the tension applied to the weft (transverse cords) and this in turn leads on to variations in width. A nominal size can vary from actual nominal to nominal minus 10% will still posses the same UTS and WLL. Proof loading FWS with trapezoidal links requires a proof loading rig that transfers the force into the outer corners of the link. This is important becuase if the force is applied at a single point in centre of link it will bend.